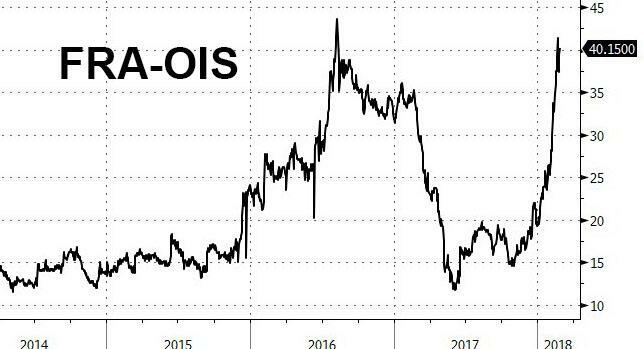 Meanwhile, we'll just note that the same Libor-OIS (or its intraday updated cousin, the FRA-OIS) we highlighted less than a week ago when it was "only" 32.7bps, has blown out by 8 bps in just the past week, and is now over 40bps, the widest since October 2016 and blowing out, a huge move when one considers the hundreds of billions in TRS and other layered swaps levering even one basis point. 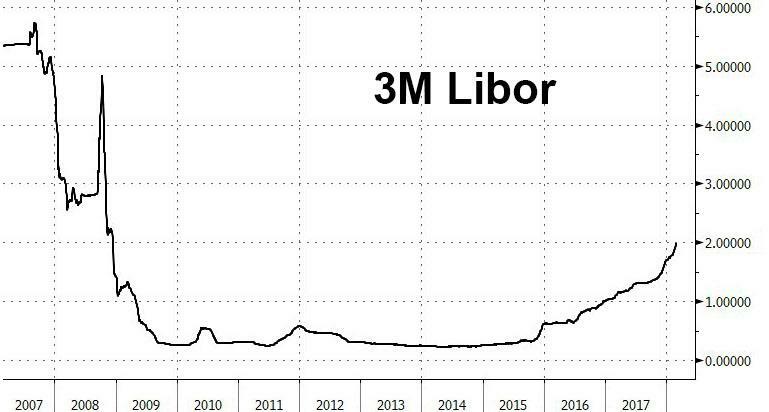 Then there is Libor: as of today, the benchmark 3M USD Libor has risen above 2% for the first time since December 2008, as financial conditions, if only in the unsecured dollar funding market - which just happens to benchmark trillions in securities - becomes dangerously tight. Putting the move in context, one week ago, JPMorgan and BofA said they expect 3M Libor to hit 2% by end-1Q; it get there 5 weeks early as the bond vigilantes wake up. So what is going on? 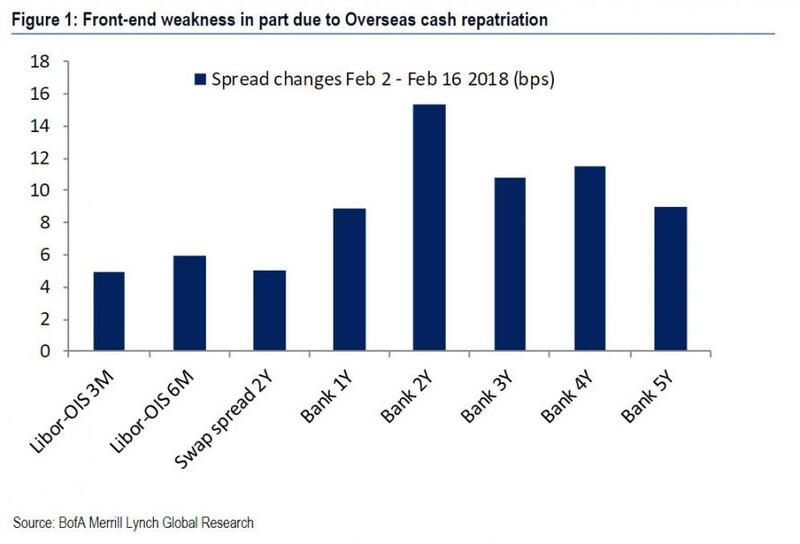 As we explained not once but twice last week, there are fears that repatriation flows will soak up all much of the excess liquidity on the front end as companies rush to delever. Then there is the recent surge in bill issuance: as Citi wrotes last week, there is evidence that last week’s $200bn surge in T-bill and Treasury issuance "may be contributing to a tightening in $ financial conditions" which represents a negative for credit. As Citi explained, in addition to the direct effect of the issuance on real yields, when the US Treasury raises money it initially deposits it in the Treasury General Account (TGA) at the Fed. Rather than growing its balance sheet, the Fed effectively sterilizes these deposits with a reduction in private sector banks’ excess reserves. This in turn reduces the capital available to be deployed in markets for cross-currency and other arbitrages, and means there is a direct link between the rise in the TGA and this week’s rise in $ Libor-OIS (chart below, left hand side). Another adverse effect, one we discussed last week, is that this also feeds through into a more negative €-$ cross-currency basis (shown below), making FX-hedged purchases of US securities more expensive for foreigners. According to Citi estimates, a rise in the TGA to around $350bn ought to add 2-4bp to the basis; however Citi also suspects the effect may prove considerably greater (chart above, right hand side). 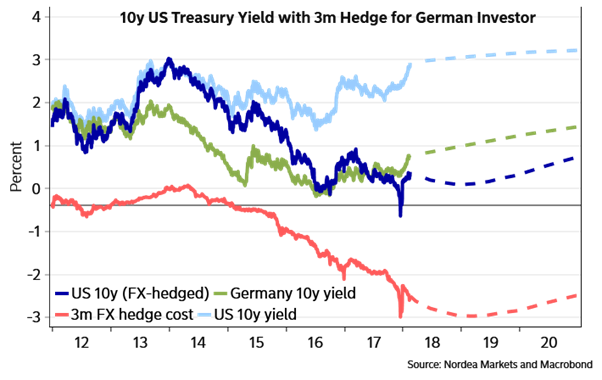 As we said last Friday, "the irony is that the tighter the USD-funding conditions get, the wider the FRA/OIS spread will drift, the less global demand for FX-hedged US paper there will be, the higher US Treasury rates rise to prompt demand, until eventually yields push so high that the already stretched correlation between rising yields and stocks finally snaps, leading to an equity correction (or crash), which in turn forces the Fed to ease financial conditions, resetting the cycle all over again." ... it may prove the most forward-looking canary in this particular coal mine.